The first New Rules Summit hosted by the New York Times happened to fall during perhaps one of the most momentous times in our nation’s history, the Senate Judiciary Committee hearings on Judge Brett Cavanaugh. Bringing together powerful leaders from across industries and New York Times’ journalists, this gathering leveraged the Times’ recent Pulitzer Prize-winning reporting on gender and the workplace. The goal was to lay the foundation for a new set of rules for today’s challenging times that women are facing globally. The day and a half of reckoning was energizing, enlightening, riveting and a hell of a reality check. 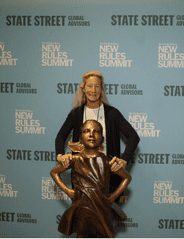 Chris Goddard, president of CGPR, standing strong with State Street Global Advisors’ Fearless Girl. I was privileged to be in the company of former mayors, CEOs, venture capital pros, entrepreneurs, professionals on their journey and the NYT staff and reporters who guided us through two days of important discussions that needed to take place. It is essential that the dialogues born here continue. Oh, what a day and night. With amazing views of lower Manhattan, the buildings of Wall Street and the vibrancy of the Brooklyn Bridge, we heard from accomplished business leaders, founders of the #metoo movement, Pulitzer Prize journalists, global leaders, financial giants and hopeful candidates for Congress hoping to make a difference. We were all captivated in between sessions by Thursday’s hearings on Capitol Hill — glued to the words of a courageous woman in the midst of a Supreme Court confirmation process that sadly repeated history — have we really not made any process? That day, we weren’t sure. Friday, September 28, when Senator Flake asked for the FBI to step in gave us hope. Melinda Gates shared her commitment and her sense of purpose for helping women in developing countries an eloquent session hosted by Nicholas Kristof, a columnist for The New York Times since 2001. Speaking to Jessica Bennett, gender editor, The New York Times, Emmy Award-winning actress and activist America Ferrara lit up the room with her personal story and why we must look beyond the financial rationale of gender equality and look to the human factor; it is about much more than movies that ring in big sales. Bennett kicked off day two with the note that she was born the same year that Sally Ride became the first woman in space, wearing a space suit, yet a decade later, a woman could still not wear pants on the Senate floor. A few minutes later, she celebrated her work for the fact that she is challenged daily to challenge conventional wisdom to uncover stories that have long been overlooked. The session called “Disrupting Silicon Valley” with Stacy Brown Philpot, CEO Task Rabbit, Belinda Johnson, COO AirBnB, and Aileen Lee, manager of Cowboy Ventures, narrated by Kara Swisher, contributing opinion writer, The New York Times had three clear asks, make lists, take action and call people out. Our working group of six was adeptly led by Adrienne Carter, NYT deputy business editor. We were charged with looking at the issue of creating equitable and inclusive workplace cultures from a policy standpoint. The larger group was looking at what businesses and individuals should do. The conclusions for the day? What’s Next? We must continue these discussions; we can’t forget what we started here. We must be fearless and confident. We must take ownership. We must call people on the carpet. We must make it personal. We must ask for what we need. We must support each other. 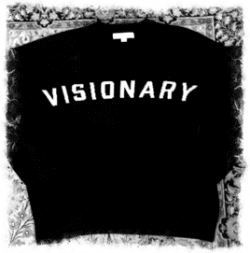 Perhaps it was just coincidence that the pop-up shop at the event hotel was offering this sweater for sale? I don’t think so. I bought three.